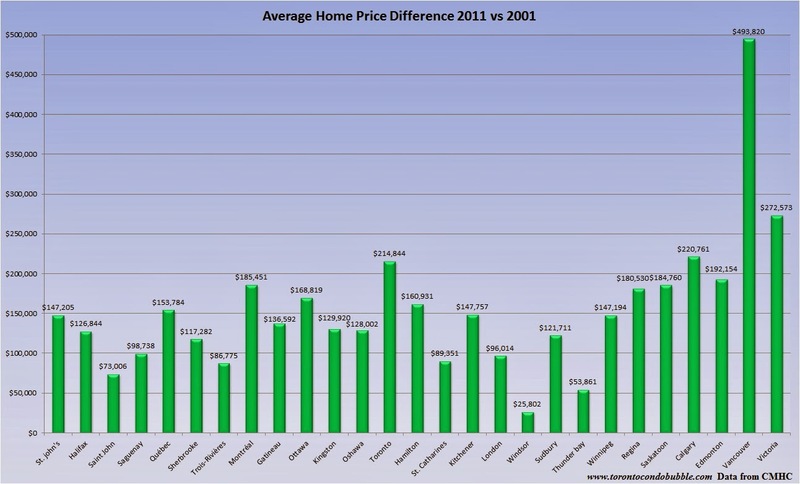 How Much Did Average Home Prices Rise Between 2001-2011? There is a reason why the subtitle of this blog says "Largest housing bubble in Canada... Except for Vancouver of course." You see in just a decade home prices in Vancouver have skyrocketed by almost half a million dollars while the average home price in Toronto rose by just over $200,000. In Toronto (GTA), the 2001 average home price was $251,508. Ten years later, the average home price was $466,352. When adjusted for inflation, the average home price in Toronto increased by $156,000 between 2001 and 2011. During the same time period real median incomes (adjusted for inflation) actually declined by $1,900 from $67,400 to $65,500. Bloody marvelous! So whenever somebody tells you that home prices in this city rose because of rising wages you now know that they are full of sh*t.